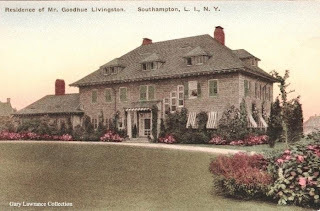 'Old Trees', the Goodhue Livingston estate designed by himself c. 1911 in Southampton. Click HERE for more on 'Old Trees'. Click HERE to see the residence on google earth and HERE on bing. Photo from the Gary Lawrance Collection. I think I may have mentioned this before, so forgive the repeat, but it interests me: I sat next to Livingston's granddaughter at a dinner party a few years back, and conversation got around to this house, which she said was one of her grandfather's favorite designs. What fascinated me was that she said he modeled it after 'Montgomery Place', a Livingston family house in the Hudson Valley. If one has ever seen 'Montgomery Place', this seems very unlikely, but that the family thought it so is worth recording. She also said it was her grandfather's favorite of his domestic designs. Both nice houses but I also don't see much similarity. 'Old Trees' is good looking -- than & now.